Free Express shipping is offered on orders of $99+. Free express shipping on orders $99+ applies to orders shipped within the US (and US territories) only. Standard shipping for orders less than $99 total will be $6.99. Orders $500+ will be sent signature required. We apologize, but we are unable to ship to P.O. boxes or APO addresses. Orders placed on this website are shipped from our facility in Princeton, New Jersey. When standard shipping is selected, orders will typically leave our facility within 1 - 3 business days (may be up to 4 business days during extremely busy holiday periods). Estimated transit/delivery time within the continental US is 2 - 5 business days. 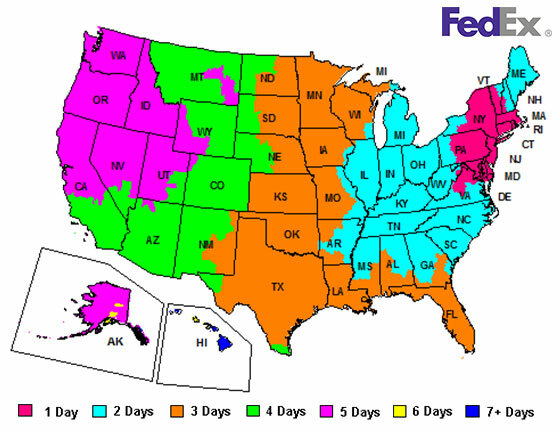 Please see FedEx zone map below for estimated delivery time to your specific area, weather permitting. Outside the continental US, please allow 3 - 7 extra business days for shipping to US territories. Your order will be carefully packed in protective materials, and you will receive a shipping notification via email when your package is on it's way. Expedited shipping: If ordered by 3 pm EST with expedited shipping, your order will be shipped the same day and will arrive the following business day, by the end of the day. This option is available during checkout for an additional $25 charge (any order total). Free standard ground shipping is offered on orders of $149+ within the Caribbean, Mexico, Central America, and South America. Free standard ground shipping on orders $149+ applies to orders shipped internationally only. Standard ground shipping for international orders less than $149 will be $11.99. All local duties and taxes on international orders will be the responsibility of the purchaser and will be due upon receipt. Orders placed on this website are shipped from our facility in Princeton, New Jersey, USA. When standard shipping is selected, orders will typically leave our facility within 1 - 3 business days (may be up to 4 business days during extremely busy holiday periods). Estimated transit/delivery time for international orders is 10-19 business days. Please note, returns on Central and South American orders are at the discretion of the customer and will not be reimbursed by Trollbeads. For any questions on the status of your order, please contact our customer service team at 1 (855) 380-8764 or email info@trollbeads-unitedstates.com. Already have a Fed Ex tracking number? Click here to track your package with FedEx. Adding beautiful gift wrap is complimentary for each order and can be selected during checkout. It is our standard to wrap all items in your order together, however if you wish to have your items wrapped separately for multiple recipients please place separate orders and choose gift wrap for each one, or contact our customer service team immediately after placing your order and they will do their best to assist. All US purchases made on this website are eligible to be returned within 30 days of delivery from within the US. Please contact our customer service team at info@trollbeads-unitedstates.com for a shipping label and return form. PLEASE NOTE: a $2.99 shipping fee will be deducted from your refund amount. You may use alternative shipping methods for your return at your own discretion. We recommend including insurance on all return packages that use alternate shipping but it is not required; Trollbeads is not responsible for lost, stolen or damage merchandise sent using an alternate return shipping method. If you purchased items from a different online store or from a store location, please return the items to the same location. We are unable to accept returns of items not purchased on this website. Jewelry purchased from the US online store is accepted for exchange if returned in saleable condition within 30 days. Some exclusions may apply. Please contact our customer care team for instructions and assistance with ordering your new items. Please complete the return form and package the items in a shipping box or envelope with sufficient protective material to defend against damage during shipping. Please note RETURN on the package and attach the pre-paid return label. We will refund the value of the returned item and applicable taxes (less shipping fee if pre-paid label is used) that you were charged within 7 - 10 business days of your return reaching our NJ facility. Expedited shipping charges are non-refundable. In the event we made an error on your order, all charges are eligible for refund. Jewelry purchased from the US online store is accepted for exchange if returned in saleable condition within 30 days. Please complete the return form as advised and follow the same shipping instructions as you would for a return. Some exclusions may apply. Please contact our customer care team for instructions and assistance with ordering your new items. 1 (855) 380-8764 or email info@trollbeads-unitedstates.com. Once your order has been placed you will receive an order confirmation email. Unfortunately we are unable to change items or add/remove items to any orders once they have been submitted. If you need additional items please place another online order, or contact our customer service team and they will be happy to assist you. During certain periods we may offer special promotions on specific items or groups of items. The best way to learn of upcoming promotions is to join our mailing list. Details of each promotion will be made available on our website and in our email newsletters. Unfortunately, we are unable to extend discounts or offers to orders that were placed prior to or after the noted promotion period. We produce only top quality products and know you'll love them. That's why all items purchased through www.trollbeads.com are covered by a 2-year limited product warranty. Click here to view our Limited Warranty. If you have any questions, please feel free to call us toll-free at 1 (855) 380-8764 or email info@trollbeads-unitedstates.com.